Walt Disney Television Animation, Toon City Animation, Inc.
For the history of Mickey Mouse, check out the post here. Promo image for "Roller Coaster Painters". Feeling Disney had begun to lose touch with its characters and the traditions that built it, Roberts Gannaway and Tony Craig pitched a new series to the studio designed to recapture the feel of its golden days of animated theatrical shorts. Disney’s Mickey Mouse Works was Mickey’s (Wayne Allwine, with Quinton Flynn covering in several episodes) first time being the subject of short films since 1953, although he had appeared in full-length features in the interim. The series was built around being an eclectic collection of short stories of varying length utilizing a simple color palette and the studio’s original sound effects from its Golden Age. Gannaway and Craig’s long-term ambition for the series was to reinvigorate the concept of the theatrical short, using these shorts to air before Disney features once they had finished their network run. Allwine, the official voice of Mickey, was looking forward to playing the character closer to the mischievous and cunning version he had once been as opposed to the white-bread, goody goody corporate mascot he had become. Minnie being startled by an unruly trumpet. The majority of the skits involved individual characters from Mickey’s universe, including new characters Mrs. Turtle (Estelle Harris) and her son, Baby Shelby (Jeff Bennett). A recurring series would feature Mickey, Donald (Tony Anselmo) and Goofy (Bill Farmer) running some kind of specialized business; often with disastrous results. There were also several recurring 90-second gag segments marked with umbrella titles: Mickey to the Rescue, which showed Mickey rescuing Minnie (Russi Taylor) from the sinister machinations of his arch-rival, Pete (Jim Cummings); Maestro Minnie, which had Minnie trying to conduct an orchestra of sentient instruments as an homage to the Silly Symphonies series; Goofy’s Extreme Sports had Goofy showing off various sports to the words of an unseen narrator (Corey Burton); Donald’s Dynamite saw the hapless duck always ending up with a bomb he had to get rid of safely; Von Drake’s House of Genius explored the many inventions of Ludwig Von Drake (Burton); and Pluto Gets the Paper followed the misadventures of Pluto (Farmer) as he tried to retrieve a newspaper for Mickey. Goofy also starred in a segment of “How to” shorts with the narrator explaining to him how to preform his given tasks; an homage to the series of theatrical shorts that began with 1940’s Goofy’s Glider. Pluto battles some sticky gum for Mickey's paper. Disney’s Mickey Mouse Works debuted on ABC on May 1, 1999 as part of the Disney’s One Saturday Morning programming block. Each episode’s intro ended with Donald attempting to steal the spotlight in different ways and usually ending up being punished somehow for it (such as riding in on an elephant that ends up sitting on him, or opening an umbrella with his starring credit written on it only to be struck by lightning, etc.). 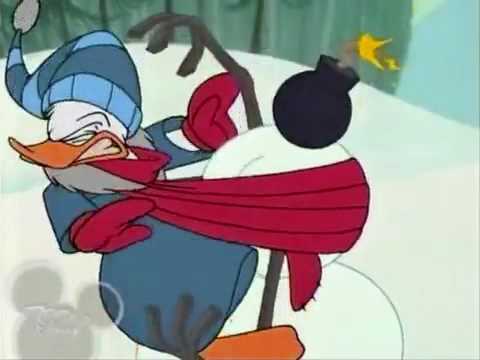 These gags were removed for the broadcasts in Finland where the show was called Akun Tehdas (Donald’s Factory), due to Donald’s popularity in the country. The series was written by Gannaway and Craig, along with Tracy Berna, Kevin Campbell, Thomas Hart, Elizabeth Stonecipher, Jess Winfield, Steve Roberts and Rick Calabash. Stephen James Taylor composed the series’ music, and Toon City Animation, Inc. handled the animation duties. Minnie held captive by Pete and awaiting Mickey's rescue. Mouse Works ran for two seasons, receiving nominations for three Annie Awards, three Daytime Emmy Awards, winning two, and three Motion Picture Sound Editors Awards, also winning two. Despite that, and the high quality of the production, the series failed to draw a significant audience. Gannaway and Craig ended the series in order to retool and revamp it with a unifying feature, debuting Disney’s House of Mouse that January. House of Mouse would go on to reuse all of the shorts produced for Mouse Works, save “Minnie Takes Care of Pluto” and “Pluto Gets the Paper: Vending Machine” due to their violent content (which also got them banned from ABC after their initial airings, although were still seen in international broadcasts). 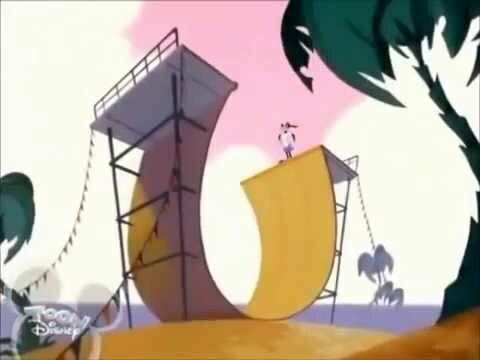 Goofy prepares to tackle an EXTREEEEEEEEEME ramp. 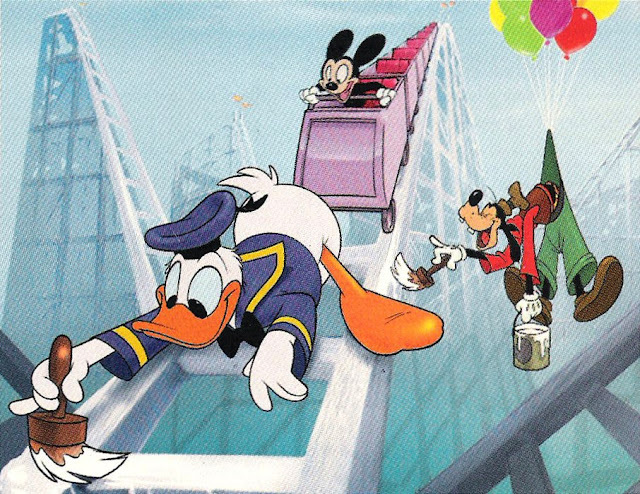 Although Gannaway and Craig’s grand plan of reviving the theatrical short didn’t come to fruition, three of the gag segments were shown in theaters: “Goofy’s Extreme Sports: Skating the Half Pipe” with I’ll Be Home For Christmas and Mighty Joe Young; “Pluto Gets the Paper: Spaceship” with My Favorite Martian; and “Donald’s Dynamite: Opera Box” with Doug’s 1st Movie. Some of the shorts were used before and after Toon Disney’s Big Movie Show on weekdays, maintaining the Mouse Works closing credits. Some days Donald just can't get rid of a bomb. Several of the shorts from Mouse Works and exclusively from House of Mouse had been made available in Europe on the DVD Mickey’s Laugh Factory in 2005. “Around the World in Eighty Days” and “Mickey’s Mechanical House” were included in Disney’s Learning Adventures: Mickey’s Seeing the World. 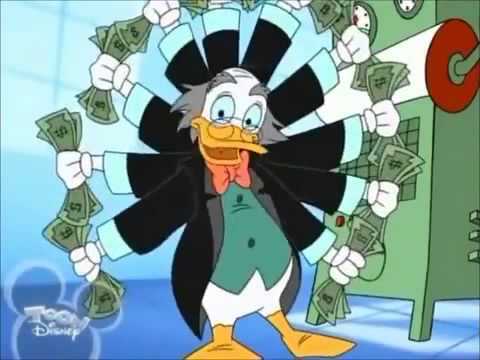 Another collection of 10 Donald Duck-based shorts from both shows were included as bonus features on The Chronological Donald, Volume 4 in 2008. “Mickey to the Rescue: Train Tracks / How to be a Waiter / Maestro Minni: William Tell Overture / Donald’s Failed Fourth / Roller Coaster Painters” (5/1/99) – Mickey must rescue Minnie from an approaching train. / Tired of being a waiter, Goofy sets out to become a film star. 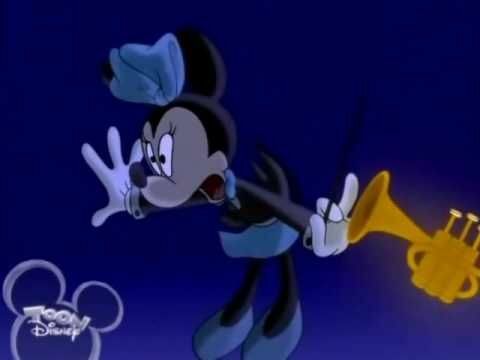 / Minnie’s orchestral duties are put on hold due to a runaway trumpet. / Donald finds difficulty in setting up for a romantic fireworks viewing with Daisy. / Mickey, Donald and Goofy compete to paint the most of a rollercoaster for a free lifetime pass to the park. “Goofy’s Extreme Sports: Skating the Half Pipe / Mickey’s New Car / Pluto’s Penthouse Sweet / Donald’s Shell Shots” (5/8/99) – Goofy demonstrates rollerblading. / Mickey’s new car is too advanced for his own good. / A lonely Pluto sets his sights on a dog that resides in a skyscraper penthouse. / Donald is hired to take a photo of the uncooperative turtle, Shelby. “Donald’s Dynamite: Bowling Alley / Mickey’s Airplane Kit / Von Drake’s House of Genius: Time Reverser / Turkey Catchers / Dance of the Goofys” (5/15/99) – Donald’s bowling ball ends up being a bomb. / Mickey rushes to assemble his airplane kit for his date with Minnie. / Von Drake’s time machine ends up landing him in some trouble. / Mickey, Donald and Goofy start a turkey catching business but end up befriending their prey. / The head Goofy Fairy is captured by a young boy with ambitions to be a mad scientist. “Pluto Gets the Paper: Spaceship / Donald’s Rocket Ruckus / Goofy’s Extreme Sports: Paracycling / Organ Donors / Mickey’s Mistake” (5/22/99) – Fetching the paper leads Pluto to be abducted by aliens. / Donald tries to prevent his nephews from riding the best ride at the park. / Goofy demonstrates paracycling off of a cliff. / Mickey, Donald and Goofy’s organ delivery ends up becoming far too literal for their liking. / Mickey uses money he found to buy Minnie a gift, only to discover that money belonged to the orphans. “Maestro Minnie: Hungarian Rhapsody No. 6 / How to be A Spy / Donald’s Valentine Dollar / Pluto’s Kittens” (5/29/99) – Minnie and the instruments disagree over the kind of music they want to play. / Goofy gets a mail-order spy kit to find out what his neighbors are up to. / The only dollar Donald has for Daisy’s gift gets blown away. / Pluto rescues three abandoned kittens and tries to hide them from Mickey. “Von Drake’s House of Genius: Remote Controlled Laser Lawn Mower / Pluto vs. the Watchdog / Donald’s Dynamite: Opera Box / Around the World in Eighty Days” (6/5/99) – Von Drake’s latest invention goes out of control. / Mickey gets a new watchdog, which plays perfectly into Pete’s plans. / A night at the opera is interrupted when Donald finds a bomb in Daisy’s purse. / Mickey has to travel around the world in 80 days to get his inheritance and save an orphanage. “Donald’s Dynamite: Fishing / Purple Pluto / Von Drake’s House of Genius: Money Increaser / Sandwich Makers / Pluto’s Arrow Error” (6/12/99) – While fishing, Donald reels in a bomb. / While prepping Pluto for a dog show Minnie accidentally dyes him purple. / Von Drake’s new invention was meant to quell poverty, but ends up getting him busted. / Goofy’s management of a sandwich shop makes him mad with power. / Pluto plans to use Cupid’s arrows to win back Dinah. “Mickey to the Rescue: Staircase / Pluto Runs Away / Daisy Bothers Minnie / How to Ride a Bicycle” (6/19/99) – Mickey has to traverse a dangerous stairway to rescue Minnie. / Pluto runs away after Mickey disciplines him for digging up the yard. / Minnie’s quiet evening is interrupted when Daisy wants to hang out. / Goofy learns how to ride a bike to feed his desire to compete. “Goofy’s Extreme Sports: Rock Climbing / Hansel and Gretel / Donald On Ice / Mickey’s Mechanical House” (9/11/99) – Goofy’s goofiness adds a challenge to rock climbing. / Mickey and Minnie encounter an old witch in the woods. / Donald accidentally destroys the snowman his nephews were building for a contest. / Mickey buys a new house that can run itself. 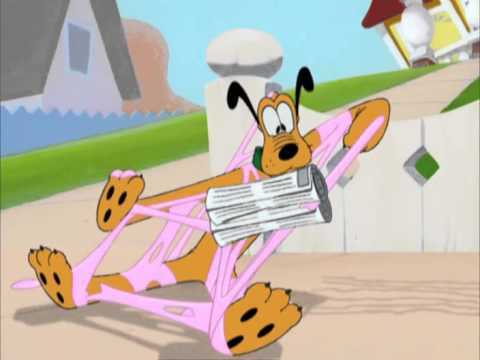 “Pluto Gets the Paper: Street Cleaner / Donald’s Dinner Date / Maestro Minnie: Brahms Lullabye / Hydro Squirter / Mickey’s Piano Lesson” (9/18/99) – Fetching the newspaper leads Pluto to be sucked up by a street cleaner. / Donald has to hold his temper on his date with Daisy. / Minnie dozes off while conducting her favorite lullaby. / Fixing his shower leads Von Drake to accidentally make it a teleporter. / Minnie signs herself and Mickey up for a piano recital that Mickey doesn’t believe he needs to practice for. “Mickey to the Rescue: Cage and Cannons / Mickey’s Remedy / Goofy’s Extreme Sports: Wakeboarding / A Midsummer Night’s Dream” (9/25/99) – Mickey must rescue Mnnie from Pete’s funhouse. / Donald lets Mickey try watching his nephews. / Goofy wipes out as he tries some wakeboard stunts. / The mice and ducks deal with mismatched lovers and a love potion. “Pluto Gets the Paper: Bubble Gum / Mickey Tries to Cook / Donald and the Big Nut / Topsy Turvy Town” (10/2/99) – Pluto battles with a piece of gum for the newspaper. / Mickey tries to cook to win back Minnie’s affections. / Donald has to defend his giant nut from Chip and Dale so that he can enter it into competitions. / Mickey and Minnie accidentally break Topsy Turvy Town’s strange laws and end up imprisoned. “Von Drake’s House of Genius: Teledinger / How to Haunt a House / Maestro Minnie: Flight of the Bumblebee / The Nutcracker” (10/30/99) – Von Drake unwittingly invents…the telephone? / Goofy plays a ghost tasked with scaring Donald. / Minnie’s orchestrations are interrupted by a bumblebee. / Minnie’s nutcracker doll turns into a handsome prince in order to rescue her from the Mouse King. “Pluto gets the Paper: Vending Machine / Donald’s Grizzly Guest / Donald’s Dynamite: Snowman / Mickey Foils the Phantom Blot” (11/6/99) – Pluto tries to get the paper out of a vending machine. / The rainy seasons drives Humphrey the Bear from his leaky cave to Donald’s house. / Donald discovers his snowman’s head is a bomb. / Von Drake’s mysterious package is stolen from Mickey, Donald and Goofy by the Phantom Blot. “Daisy’s Road Trip / Goofy’s Big Kitty / Relaxing with Von Drake” (12/4/99) – Daisy invites herself on Mickey and Minnie’s quiet sunset drive. / Goofy gets a new kitty at the same time a lion escapes from the zoo. / Von Drake uses Donald to demonstrate various methods of stress management. “How to be a Baseball Fan / Locksmiths / Minnie takes Care of Pluto” (1/22/00) – Goofy takes a break from sports to be a fan. / Mickey, Donald and Goofy are bumbling locksmiths. / An abrupt drop-off at Minnie’s leads Pluto to believe she’s out to get him. “Donald’s Dynamite: Magic Act / Survival of the Woodchucks / Mickey’s Rival Returns / Mickey and the Seagull” (2/19/00) – Donald’s magic act is interrupted by a reappearing bomb. / Donald’s nephews discover he never finished a required Junior Woodchuck survival course. 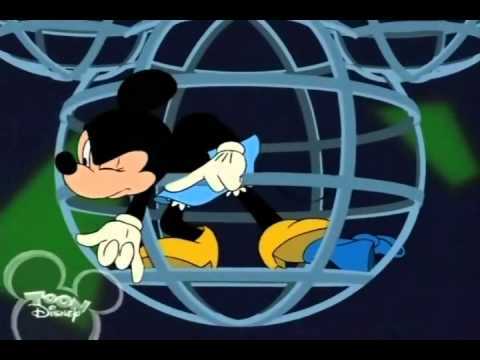 / Mickey’s good day is ruined by the appearance of Mortimer Mouse. / Mickey is assigned a replacement seagull after his regular one is injured. “Goofy’s Radio / Car Washers / Pluto’s Seal Deal” (3/11/00) – Goofy decides to relax in the park with a radio. / Mickey, Donald and Goofy’s first customer is Pete, whose car goes through a destructive washing machine. / Pluto must guard Mickey’s package, which mistakenly ends up being a live seal. “Mickey’s Mixed Nuts / Goofy’s Extreme Sports: Shark Feeding / Mickey’s Mountain / computer.don” (4/15/00) – Mickey competes with Chip and Dale to get a store’s last batch of nuts. / Goofy heads out to feed the sharks. / Mickey races Pete up a mountain to win the rights to name it after Minnie. / Daisy convinces Donald to buy his first computer. “Donald’s Halloween Scare / Donald’s Lighthouse / How to Take Care of Your Yard” (5/20/00) – When Donald scares his nephews to get their candy, they plot their revenge. / Donald attempts to get rid of a stubborn pelican. / Goofy learns yard care for every season. “Pluto Gets the Paper: Mortimer / Minnie Visits Daisy / How to Wash Dishes / Domesticated Donald” (6/10/00) – Mortimer tries to steal Mickey’s paper. / Minnie brings a pie to Daisy but can’t seem to get her attention. / Goofy goes traveling and makes liberal use of his credit card. / Donald has to babysit Shelby. “Mickey’s Mix-Up / Whitewater Donald / Mickey’s Christmas Chaos” (9/16/00) – Mickey sends faxes to Minnie and Mortimer but is afraid he got them mixed up. / Daisy thinks Donald is taking her on a romantic date when he’s actually taking her fishing. / Mickey and Mortimer compete for a house decorating contest. “Donald’s Fish Fry / Presto Pluto / Mickey’s Cabin” (10/21/00) – Humphrey goes to get a big fish for the winter and ends up taking the one Donald just caught. / Pluto swallows a magic wand while competing for Dinah’s affections. / Mickey ends up trapped with Pete and Zeke after they stole an ATM. “Pluto Gets the Paper: Vending Machine* / Mickey’s Answering Service / Pluto’s Magic Paws / Mickey’s Big Break” (11/18/00) – Mickey, Donald and Goofy start a telephone answering service. / Mickey accidentally gets magic gloves from the drycleaner. / Mickey and Donald have to replace a picture they broke while playing football indoors. “Bird Brained Donald / How to be a Gentleman / Donald’s Pool” (12/16/00) – Donald attempts to get a picture of the Aracuan Bird. / Goofy learns manners in order to join a ritzy country club. / Donald’s relaxing day at the pool is interrupted by Mrs. Turtle and Shelby.